Once a pianist, New Orleans furniture maker and restorer now works to a different tune in his tiny shop. Dan Alleger&apos;s life was all set; he was destined to be a professional musician. After years of study at Boston&apos;s Berklee College of Music and the Boston Conservatory, his future had jazz pianist written all over it. 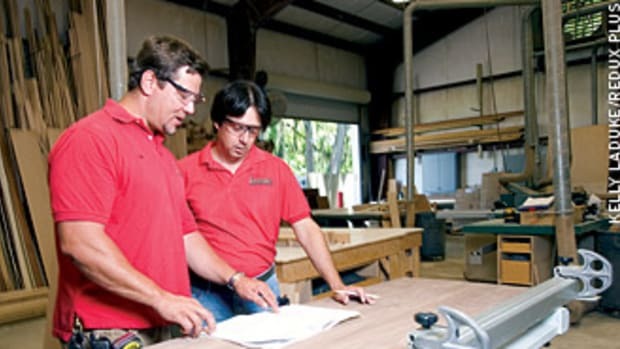 But as happens with so many people in life, things didn&apos;t work out as originally planned and he eventually found himself in the Big Easy, building custom furniture and doing restoration work, much of it in the wake of Hurricane Katrina. His shop is a mere 200 sq. ft., smaller than many of the practice rooms where he spent thousands of hours honing his piano skills. But through outsourcing, using space in other people&apos;s shops and being incredibly organized, he is able to tackle jobs of all types and sizes. About 10 years ago, Alleger and his wife, Joy, left Boston for New Orleans. The main reason for the move was for his wife to work on her doctorate at Tulane University and because New Orleans was a great place for a jazz pianist, or so Alleger thought. But like Boston, which was saturated with woodworkers, Alleger found New Orleans to be saturated with musicians. 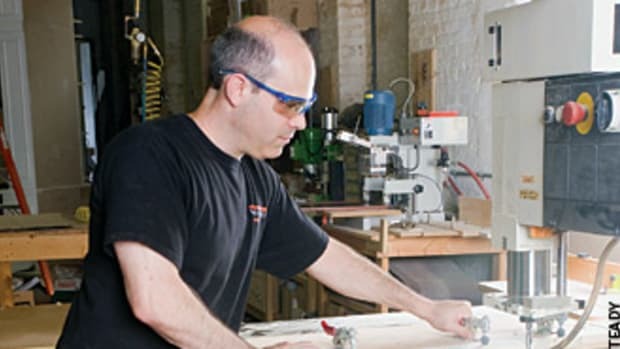 After finding piano gigs hard to come by and the pay barely more than a pittance, he came to the realization woodworking would be a more lucrative vocation than that of a struggling jazz pianist. "I was pretty determined to really go for it," Alleger says. "I&apos;d been reading books, gobbling up whatever I could. 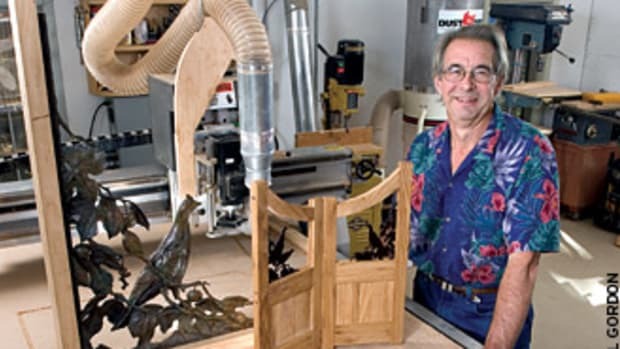 And I could say a lot of good things about Norm Abrams because he has a show that promotes woodworking. A lot of people criticize a lot of things he does and I&apos;m right there with them, especially when it comes to finishing. But at the very least I did learn a lot watching that show about basics and enough to kind of push me into starting up." 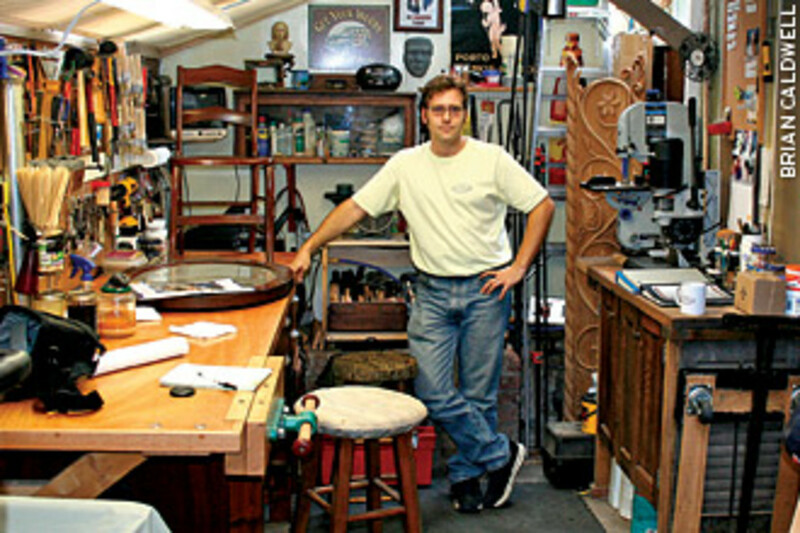 Alleger was surprised to find a relatively small amount of custom woodworkers in the New Orleans area when he arrived and only a few that promoted themselves. There also was a void of experienced finishers as well as woodworkers willing to take on caning and weaving jobs. Working in a 200-sq.-ft. shop, no matter how organized you may be, is no picnic. Alleger and his wife live in a carriage house and have been considering a move for some time, but with the birth of their first son in April, a potential move has temporarily taken a spot on the back burner. Despite the space limitations, Alleger manages to take on any type and size of job, sometimes working in his kitchen; outdoors, using an outdoor spraying facility; and working on large pieces at other New Orleans locations to get his work done. Since he doesn&apos;t own a jointer or planer, he has a relationship with a nearby mill that will dry, mill and store his wood. "There is a shop in mid-city that I use for bigger pieces from time to time. Most pieces I can do here. What I can&apos;t do here, I work with a guy who runs a studio that manufactures props for movie productions around town. They have a huge warehouse space. He&apos;s a former frame carpenter who put together a nice corner of his warehouse where he has a jointer, a planer, a lathe and a chop saw. It&apos;s a big space that sits there absolutely empty 90 percent of the time. I would probably move my whole operation over there if it was necessary. When I need to build a big piece, I build it there." Alleger&apos;s shop size occasionally works to his advantage. Once a year, he packs up the contents of the shop and moves it to a woman&apos;s garage in Metairie, La. The woman owns a mansion in Lafayette, La., and every summer she brings a few pieces of furniture she has collected through the years to Metairie for Alleger to work on. After two or three weeks on that job, he packs up his shop and hauls it back to his cramped New Orleans quarters. Alleger is a firm believer in the benefits of a Web site and the intricacies of having his business near the top of search engine inquiries. He describes his Web site as "the saving grace" for his business. He estimates about 80 percent of his business comes from his Web site and 20 percent by word of mouth. "I take the business of marketing very seriously and do everything I can to get the Web site out there; Google ranking, search engine ranking, creating a proper site map, following everybody&apos;s protocol so that when anybody types anything about New Orleans and furniture, wood or seating, I want to be at the top. I recently added a &apos;Clients Comments&apos; page to the Web site and that is one of the pages that gets the most traffic on the site. People want to hear what the other clients are saying." Alleger recently launched a second Web site specifically geared toward caning, rush work and chair repair in an effort to obtain a higher volume of smaller projects that have quick turnarounds â€” ones he can work on indoors where it&apos;s cooler and while he is babysitting. Despite his early hatred for finishing, his inability to cane or weave rush, Alleger has made a good living doing restoration work, much of that because of his persistence in studying and understanding finishing. 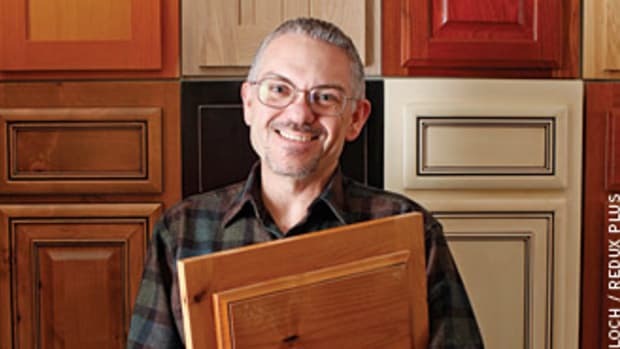 The New Orleans woodworker spent months experimenting with finishes, ordering any new finishing product out of a catalog or off the Internet just to try it out. 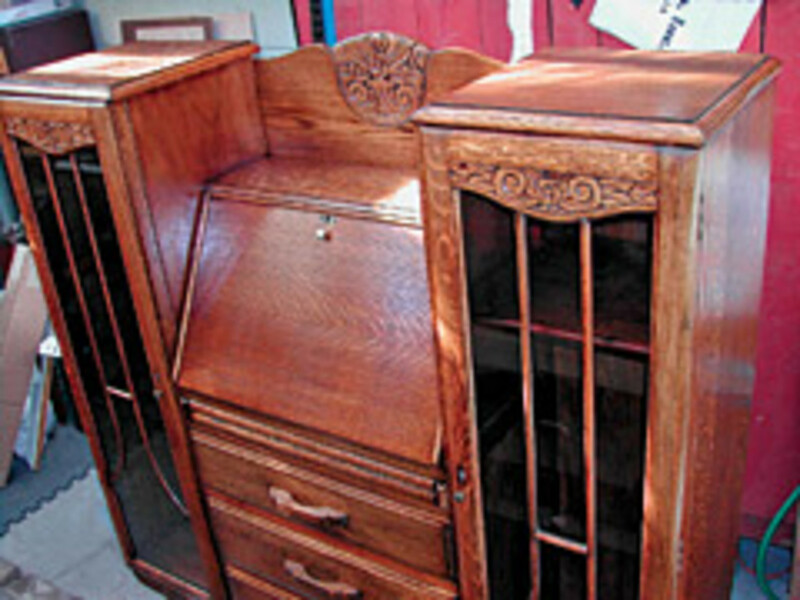 "Even before the hurricane came, I realized there was a real hole in the market for finishers here, especially antique finishers. Most people don&apos;t want to do that; they want to buy a can of Minwax, a can of polyurethane and slap it on there a la Norm Abrams and send it out the door. For a lot of folks, that&apos;s OK. For the market that I want to appeal to, these are people that have family heirlooms, antiques, or very specific requirements about how they want something built and finished and they&apos;re willing to wait for it and they&apos;re willing to pay for it. That&apos;s really what I wanted to aim for. "I ended up with a whole cabinet of finishes, half of which I never ended up using because I didn&apos;t like them, but at least I knew I didn&apos;t like them. There was a lot of experimentation because of the climate here, the humidity and the way wood moves and the way finishes react to this environment. It&apos;s a whole different ballgame than finishing in the Northeast." Alleger is meticulous about writing down recipes any time he develops a winning finish and keeps track of all of them. He has reached the point where he won&apos;t use a finish out of a can anymore, always making changes to get an acceptable result. Although most of his business is obtained through people viewing his Web site, the work is primarily local. 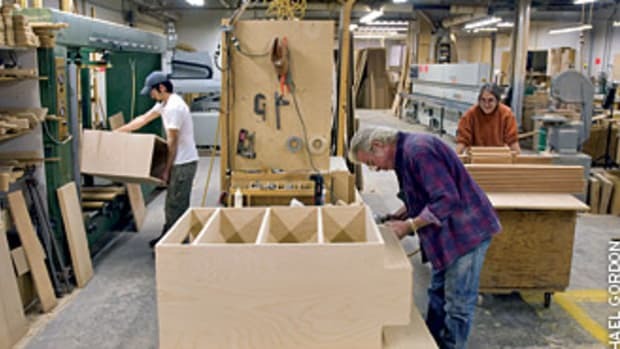 But his livelihood as a custom furniture maker took a career change the morning of Aug. 29, 2005, when Hurricane Katrina smashed into New Orleans. Katrina restoration work: "I&apos;ve kind of reached the end of my rope as far as looking at this nasty, moldy furniture that was pretty nasty a year out, really nasty two years out and now that we&apos;re coming up on almost three years, I&apos;ve become more inclined to refer it out to somebody else. Although it is rewarding, it&apos;s just not work that I need to do or have to do anymore. There&apos;s so much other good work coming in that is more profitable and a lot more representative of where I want the business to go. I don&apos;t want to be known as just the Katrina restoration furniture guy." On restoration: "I think Antiques Roadshow has freaked everybody out about doing any kind of work on an old piece. 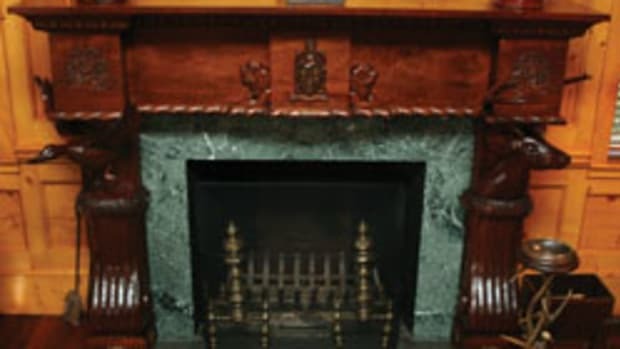 Unless it is museum quality, 90 percent of the furniture out there will increase in value with some restorative work if it is done mindfully, carefully and if in keeping with the materials and processes of the time. "Everything changed, everything changed," he recalls. 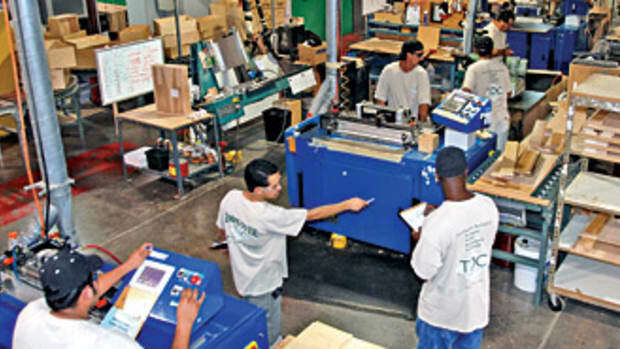 "The business went from being 60 percent custom build, 40 percent repair/refinish to 10 percent custom build. I was bummed at first because I was like a lot of woodworkers. I loved building and hated the finishing." Not long after Katrina hit, the requests for repairing and restoring family heirlooms and everyday furniture were continuous. 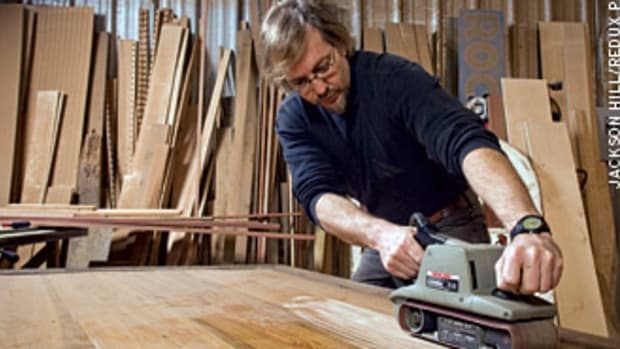 "I knew that there was a big hole in the market for restoration, nobody would do it and I kept getting calls for it and I would say, &apos;Well that&apos;s really not my arena.&apos; I do refinish some things, but in terms of chunks missing or a 200-year old finish, [other woodworkers] are scared to death to look at that sort of thing." 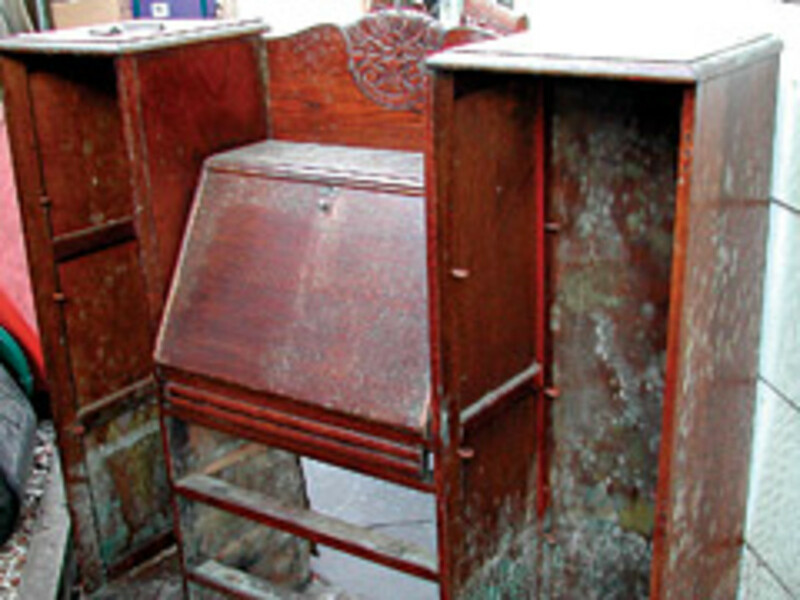 One of the first restoration jobs involved a man who brought him a chair with the seat shot. Alleger got on the Web, found out how to cane, and obtained some cane supplies from his finishing supplier. He also purchased the "Caner&apos;s Handbook" (Bruce Miller and Jim Widess, 1991, Lark Books) that has chapters on rush weaving, Danish cord, Wicker repair and even Heywood-Wakefield furniture. It didn&apos;t take long before his caning technique improved and included some complicated patterns. For people seeking to have their pieces put back together it was even more difficult to find someone who had the ability to weave rush. As with the caning, Alleger did some research and taught himself to weave and even tackled some upholstery work. "I&apos;ve gotten into it mostly because most of my customers feel better if it&apos;s &apos;one-stop shopping.&apos; Whether I do it or not, they want me to take care of it. If it is a chair or an ottoman, I can do it. I confess I have a sewing machine that I broke down and bought within the last year so I could handle the more complicated stuff. It&apos;s a good add-on, a good selling point saying I can do that for you, too. But I don&apos;t want to get into the upholstery business." After two years of predominantly restoration work, it began to wear on Alleger. He realized he was spending too much time on stripping, bleaching, deep cleaning, mold eradication and even some of the cane work. It was a good business because nobody else wanted to do it, but it was beginning to get old. About a year ago, he decided to hire a part-time employee, Brielyn Sexeny, to help with the grunt work and more difficult jobs as time progressed. His backlog was getting longer and the situation made him feel uncomfortable. "I have her doing a lot of the stuff that I didn&apos;t really feel like doing for the most part," Alleger says. "Although now that she&apos;s been here for a while, she&apos;s really developed some good skills and kind of gotten into the swing of how I like things done. It&apos;s kind of hit-or-miss when hiring someone with little or no experience. I prefer to hire someone with no experience so they absolutely do it the way I want it done and don&apos;t come in with some preconceived idea of how they want it done." Sexeny is doing a lot of the prep and stripping and caning. With the custom builds she is the sander, and of late has been cutting mortise and tenons. In late-May, Alleger hired a second part-timer to provide some extra muscle in the shop and assist him with some of the larger projects. With the two employees, Alleger&apos;s business has now settled to about 50 percent restoration and 50 percent custom builds. And as far as hurricane restoration work, he recently decided he&apos;s had enough of it. "I made what I&apos;ll call an executive decision that that was it. Everybody with really nice stuff had it restored pretty early on. The stuff trickling in now is crap furniture that people stuck in the carport because they didn&apos;t know what to do with it." There are two types of customers Alleger says he receives. One is the person who says they saw a table at the Pottery Barn that they absolutely love and want to know if he can build it. He tells them if they&apos;ve already found what they want, then go buy it at the Pottery Barn. "The other kind of customer I get calls and says I want something custom made, but I have no idea of what I want. That&apos;s an extremely tough bill to fill. I get a general sense of what they want, meet with the customer, look at the other furniture in the house, take a lot of pictures and the area of the room where they want to put the piece. I take graph paper with me and pencil-sketch stuff to at least figure out what they don&apos;t want from the beginning, and that makes my job a lot easier. Alleger uses a wide-angle photo of where the piece is going to go in the room and builds it to scale using Adobe Illustrator. He takes the vector art in Illustrator, sends the image into PhotoShop, applies wood grain fillers, shade stains, shadows and places it in the room. Then he sends the client the image of the finished piece and once they see exactly what it&apos;s like in their home, Alleger says it always "seals the deal." The custom clientele recently has been a mix of people. In the last two years many of Alleger&apos;s customers have been people who have had their children grow up and leave the house. The parents decide the time is right to spend money on something that&apos;s really for them, often furniture featuring exotic woods and fancier designs. In a small shop, there isn&apos;t much room for tools or machinery. He gets by with a 9" Delta table saw, a hollow chisel mortiser, miter saw, routers, sanders and a router table. He has several hundred finishes and had a nice collection of 80 hand planes until Katrina came along. "I lost all of them," he laments. "I was only able to salvage about a dozen out of the whole collection and that was a real bummer. I&apos;m trying to slowly build back, but it&apos;s not something that I go out actively looking for. One of the trees came down and poked a hole clean through the roof and with that came a wash of water with everything underneath it. Some of them probably could have been salvaged, but I don&apos;t think they would have been true and really worked right. It was unfortunate." 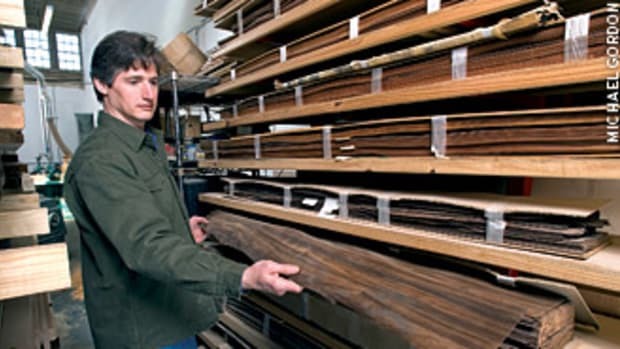 With the recent reopening of Riverside Lumber in New Orleans, which was wiped out by Katrina, Alleger can once again buy his wood and veneer locally. He orders a lot of products through Van Dyke&apos;s and his caning supplies from an Ohio company. Since he arrived in New Orleans, Alleger has never been happier. The shop is running smoothly, the restoration work is diminishing, his employees are working out, and he has a new addition to his family. Like anyone in the custom furniture business, making more money wouldn&apos;t hurt the cause, but he is realistic about the career path he selected. "There&apos;s always that hope that you&apos;ll really find that niche of the market that&apos;s the big spenders or the woodworker&apos;s benefactor, somebody who is completely selfless and wants to make a small-time guy like me rich. I never expect to make a fortune doing this, but I love being able to walk 10 steps from the coffee pot to work in the morning and that has made it worth it for me." He worries about the size of his shop and his home, but still maintains a fondness for his small shop space. "It has a certain charm, but as you can see it is incredibly cramped. I like it most of the time, but sometimes it is just awful, I&apos;m tripping over everything. I&apos;m usually doing so many different things at a time, to coordinate dry times, when I can make dust time, everything like that, it really requires a lot to be able to manage what I do in that space." The game plan is to buy a house and build a shop when the timing is right. In the interim, he can continue to outsource and produce his larger work at other locations. It takes organization, finesse and patience, but so far he is still able to get the results he wants. "A lot of people search for one thing their whole life that they&apos;re passionate about; that one thing that they can really go for and they love. I&apos;ve been extremely fortunate finding it twice. I still love playing music , and I love my woodworking."